This two-mile stretch of North Torrey Pines Road (just north of La Jolla) has attracted many of the brightest minds in life sciences, biotech, and engineering. But you don’t have to be chasing a Nobel Prize – or winning them, as denizens of this neighborhood can claim – to enjoy it. While others here labor on futuristic projects, you can bask in exquisite hotels, fine arts, legendary golf courses, and cuisine, all of which are worthy of their own Nobels. Luxury abounds along North Torrey Pines Road with three unique destination properties, each with its own unique vibe. Estancia La Jolla Hotel & Spa has a lot going on around this boutique hotel and spa, it’s not clear why you’d ever want to leave. The refined rancho-style (and pet-friendly) grounds host a heated saltwater pool with poolside cabanas and fire-pits, as well as a full-service spa, lawn games and table tennis. Be inspired by one of the most exceptional settings in Southern California when you relax at the Hilton La Jolla Torrey Pines. Atop the bluffs of La Jolla and the majestic Pacific Ocean, the resort offers a spectacular views, relaxing pools, and private balconies over looking the legendary Torrey Pines Golf Course. Awarded the AAA Five Diamond rating for 16 consecutive years, The Lodge at Torrey Pines offers old world elegance with modern day amenities. Featuring 1900’s Craftsman-style architecture, décor and style, the lodge exemplifies old world charm. Enjoy a front row seat to the legendary golf course as you dine at the award-winning A.R. Valentien restaurant, named Best Hotel Restaurant in the West by Sunset Magazine. Better known for the sciences, UCSD’s West Campus doubles as an art museum to this collection of 20 public works. Arrayed throughout the campus, the art can be discovered one piece at a time by walking the grounds and viewing each one in situ. The public is welcome to soak up the wind-driven sounds of The Wind Garden, ponder the meaning of the precariously perched house in the Fallen Star, and view the rest of the installations at their leisure. On a normal day, the 36-hole public golf course is a place for regular San Diegans and visitors to hit the links with a gorgeous ocean view. But every year the course becomes a stop on the PGA Tour as part of the “West Coast Swing” when the pros arrive for the Farmer’s Insurance Open each January. The course was also the host of the 2008 U.S. Open and will be the center of the golf world for the 2021 U.S. Open as well. Regarded as one of the best regional theaters in the country, the playhouse has been the launch pad for numerous works that hit the world stage on Broadway. Actors from Matthew Broderick, Kim Cattrall, and John Goodman to Holly Hunter and the legendary Groucho Marx have all helped establish its legacy. Keep up to date with the playhouse’s calendar for an advance preview of Broadway’s next big hit. This restaurant brings a creative elegance that somehow fits perfectly into the multi-use event, office, and fitness space of The Alexandria, catering to the La Jolla biotech set. Perhaps all you need to know is that it’s a project of chef Brian Malarkey, who’s bespectacled mug you may recognize from Top Chef, Guy’s Grocery Games, the Today Show, Good Morning America, and several of San Diego’s best eateries. 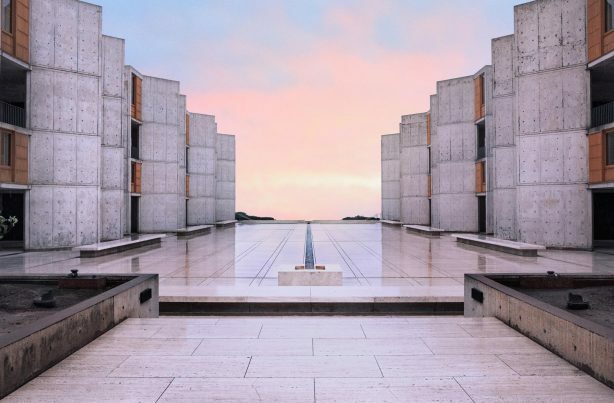 Though it’s a research campus for bio-scientists studying some of the most important and futuristic topics imaginable (cancer, aging, and genetics, among them) the Salk Institute is no less significant as an architectural jewel. The spare beauty of the buildings, designed by architecture firm Louis Kahn, speaks for itself, and the campus becomes unspeakably lovely as the dipping sun lights up its sharp angles. Visitors are welcome with reservations during normal business hours. Learn to fly! The Torrey Pines Gliderport is one of the most admired aviation sites in North America with nearly 100 years of flying history. Set along the cliffs of Torrey Pins and overlooking the Pacific Ocean, the glider port if home to professional paragliders, hang gliders, and sail planes. On any given day, dozens of flyers run the field and disappear beyond the cliff, only to resurface moments later among the clouds. Join a pro for a tandem flight and document the entire adventure with an onboard camera package. This entry was posted in Neighborhoods by San Diego Magazine. Bookmark the permalink.